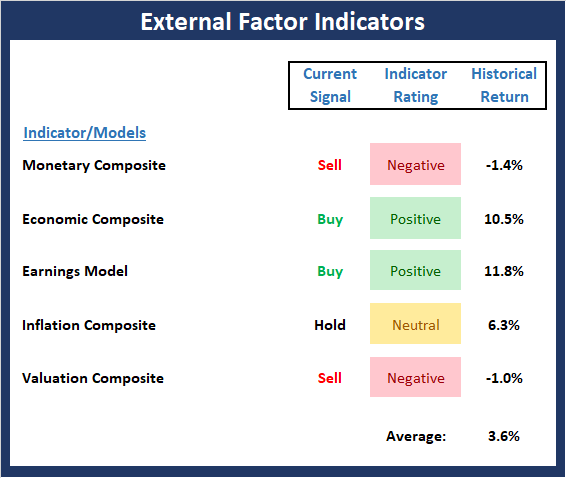 This week, we’re featuring the “External Factor” Indicator Board, which is a group of indicators designed to help us stay in line with the state of the big-picture market drivers including monetary conditions, the economy, inflation, and valuations. So here we are; staring at just 25 trading days left in the year. The bottom line on this fine Monday morning is that most investors are focusing on the negative and fearing the worst. Gone is the hope that ongoing earnings growth will produce strong stock market returns for as far as the eye could see. In its place is the idea of “correcting” prices for the new normal. A “normal” that includes the word “slowing” in front of just about every bullet point in the market narrative. In looking at the year-to-date returns of the various asset classes through Friday, the appropriate theme song for the year would be, Nowhere to Run. Take a look at the numbers below and you’ll see what I mean. What Happened to the “Easy” Week? This week was supposed to see a mild drift higher, especially after Monday. You know, it was one of those “easy” weeks where you sit back, do nothing and watch your portfolio rise. Stocks “always” rise during Thanksgiving week. It’s those strong seasonal tailwinds. Well, someone forgot to inform the bears who have been out in force selling the entire week with the exception of Wednesday morning. I know I didn’t expect to see this kind of damage this week. I thought the bears would stay at bay and allow a little holiday rally before the possible resumption and completion of the correction next week or the week after. I hate being caught off guard. Today is one of those half days for the stock market. We sometimes get them around July 4th and Christmas. The industry wants to be closed but the powers that be on the exchanges don’t want to lose coveted business to Europe. Hence the half day. It’s also a day where liquidity is very light, making it much easier to push stocks around. The day after Thanksgiving is also typically one of those “easy” days where stocks “always” rise. That doesn’t appear to be the case today, at least at the open, as the market looks to open down roughly 3/4%. With so many investors taking the day off, I wouldn’t be shocked if the bears exhaust themselves early in the day and the bulls can move stocks from there. 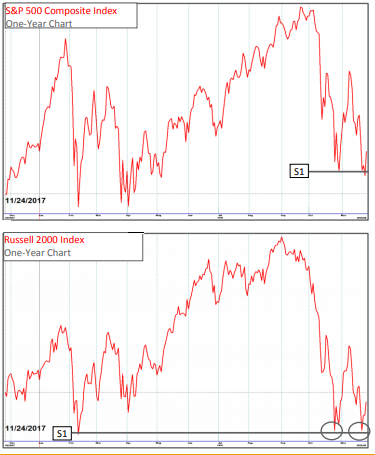 The relief rally earlier this month seems like a long time ago as the markets have now returned to the lows visited in October. We currently sit right on those lows and the bulls will need to make a stand here or risk another downdraft back down to the February and April lows. Thanksgiving week is often a quiet week with a slow upward bias. Not this year! Monday and Tuesday of this week saw losses of 3.5% in the S&P before a feeble bounce on Wednesday. Weakness has returned this morning. 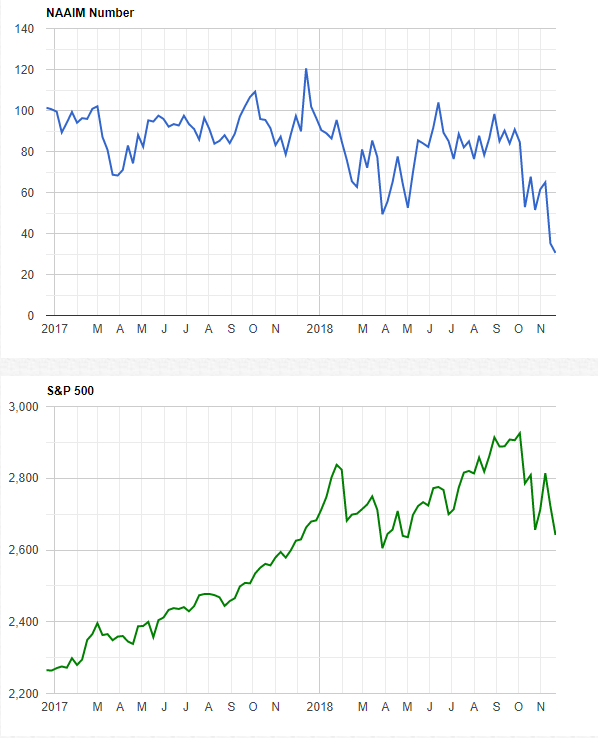 It is imperative for the market to hold at current levels or we are very likely headed back down the lows of earlier this year (some 2% lower). If those lows fail to hold, then a compelling argument could be made that a new bear market has begun and much deeper losses would be coming. The normal holiday tailwinds have yet to materialize but Santa may yet come to lessen the blow. Risk is very high and any bounces should be viewed with skepticism. We are happily sitting this out and watching from the sidelines. 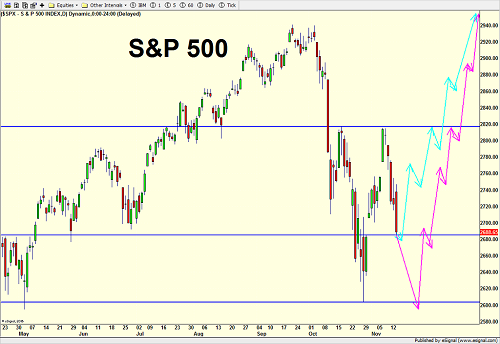 If a sustainable rally begins we will redeploy the portfolios but we remain very cautious.